5. Poor yielding fields or areas are likely fresh on your mind or evident from yield maps. These are areas where yields didn’t meet expectations and you can’t “blame” it on anything else, such as weeds, compaction, insects, soil type, herbicide injury, etc. What reinforces this is if corn yields continue to increase while soybean yields hit a plateau or even start to drop off. 4. Life is generally less hectic after harvest and you can dedicate time to taking good representative samples. Take 20-25 soil cores from the area and mix the samples together. Then take a sample from this composite sample (representing the area or field) and submit it for analysis. Sample problem areas in a field separate from normal yielding areas and compare SCN egg counts. If you don’t have yield variations and are just trying to determine if SCN is present, sample areas up to 80 acres in size. 3. You, your co-op, or your crop consultant or field scout often pull soil samples in the fall to determine fertilizer needs for the next year. When sampling for fertilizer, sample for SCN. Both need topsoil samples six to eight inches deep, making fall an opportune time to do both samples in one trip. Take a few extra cores in the field, mix them all together, and then split the sample, using half for fertilizer recommendations and half for SCN analysis. 2. The Nebraska Soybean Board promotes sampling by covering the cost of the SCN analysis. Normally there is a $20 fee for soil samples submitted to the University of Nebraska Plant and Pest Diagnostic Clinic for SCN analysis. Commercial labs will charge $15 to $30. If you submit five samples from your farming operation, you will receive the equivalent of $100 of checkoff dollars you have paid. 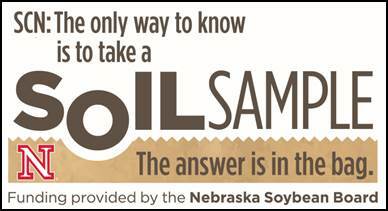 Special sample bags for this free analysis are available at your local Nebraska Extension office. So far there’s nothing too exciting or earth shaking in the first four reasons. SCN causes the most yield losses for soybean growers in Nebraska and across the U.S. These first four points all reinforce why fall is a good time to sample a field to determine if SCN is present. The newest reason is for soybean growers who already know they have SCN in their field and have been working to manage it. 1. About 98% of the SCN-resistant soybeans varieties available to farmers all use the same source of resistance (PI88788). The reason for this is simple: It was easiest to breed in this source of resistance and still maintain yields. The downside to this is that there is a lot of variability in the genetics of the SCN in any field and no source of resistance is going to control all of the SCN present. Just like using the same herbicide, insecticide, or fungicide year after year will lead to resistance, using the same source of SCN resistance will eventually allow a portion of that SCN population to survive and reproduce on soybeans with that genetic source of resistance. That is why it is important for soybean growers to check their fields periodically (every six to seven years) to see if the SCN population is increasing or decreasing. If your initial confirmation of SCN in a field was found in a soil sample taken in the fall after a soybean crop, six or seven years later sample that field again in the fall after a soybean crop. If the SCN population remains constant or decreases, your resistant varieties are doing their job. However, if SCN counts are higher, you will want to select a soybean variety with a different source of SCN resistance the next time you plant soybeans in that field. Your choices will be greatly reduced, but long-term it will be worth it to keep the SCN population in check in your field. It is much easier to identify low levels of SCN in the soil and keep them low than it is to let SCN populations increase, then try to bring them back down. contact your local Nebraska Extension office.